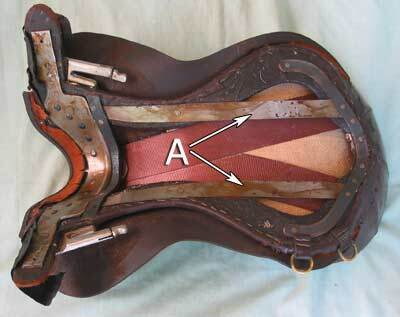 We thought it would be interesting to take a saddle apart to show exactly what’s inside a typical English saddle; how it’s assembled and also point out some features and common issues that can affect horse and rider comfort. 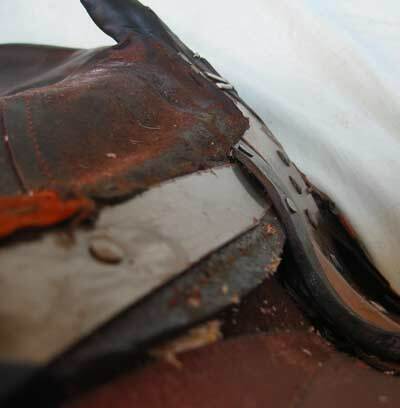 We were donated this used full leather GP saddle for this purpose and sadly found some serious problems with it – read on to see what we discovered. Here’s the underneath. It has full leather lined panels. You can see that the central gullet narrows towards the rear of the saddle. This can be due to the original design and/or the panels flattening out as the flocking compressed over a long period of time. We would have some concern over this as it is a possible cause of problems with rubbing the horse’s spine. 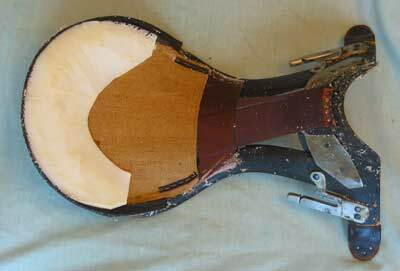 The panel has been taken out and this picture shows the side which is in contact with the saddle top. It is essentially an elaborate bag stuffed with a wool flocking. You can just about see the slits in the top of the panels where the flocking is stuffed in. 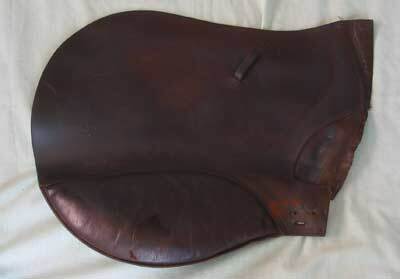 If you have a saddle re-flocked then the panel should be taken out like this, the old flocking removed and the new flocking added with the panel on a flat surface to ensure an even, consistent density of flocking. At the front of the panel you can see the point pockets which the points of the tree locate into. These pockets help to locate the panel onto the tree. Some of the flocking has been pulled out of the slit. The points of the tree are now visible. You can see the end of the metal bar which gives the strength to the front arch of the tree and sets the width fitting. Now we’ve removed the layer of leather from the gullet to reveal the underside of the tree, we’ve found a worrying problem. If you look at how the webbing for the girth straps is attached to the tree, you’ll see they are not symmetrical – the left girth straps are further forward than the right. To check this we held the girth straps out taut and parallel to the angle of the points ensuring that the webbing was pulled completely flat. 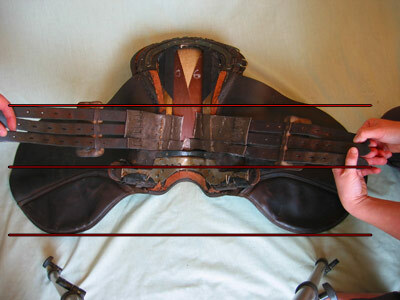 Compared to the lines that are drawn parallel to the head plate you can see how these poorly mounted girth straps will lie crooked to the saddle. This will have a significant effect on the horse. 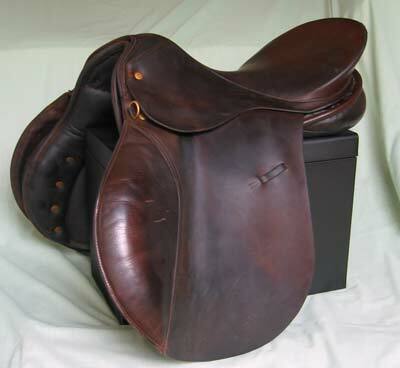 When the saddle is on the horse and you tighten the girth the straps will naturally try to even themselves up on the horse’s back. Because they are crooked on the saddle the only way they can do this is by skewing the saddle on the horses back. 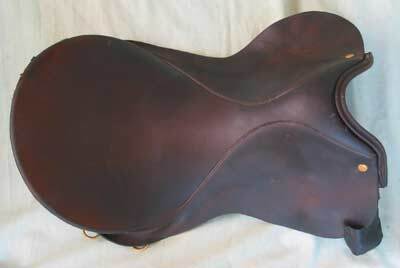 So before the rider mounts the saddle is sitting wrong on the horse. 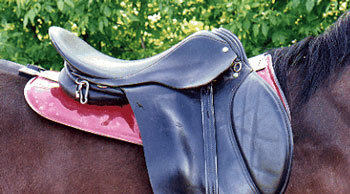 When the rider mounts they may feel that the saddle isn’t even and try to push it back to a central position. So we’ve now got several issues going on with the saddle and soon possibly have a horse with a sore back, reluctance to bend in one direction and a rider who feels out of balance in the saddle. Unfortunately the problems didn’t stop here. In the picture below we’ve highlighted a nail which was sticking up about 3mm. We were not sure what it was for; there wasn’t a matching one the other side. 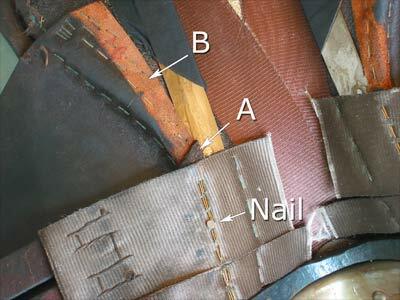 Area B shows where the leather of the saddle flap has been pared down to give a smooth join to the tree. This is very good practice but all the effort was wasted by someone leaving a large wedge of thick leather trapped between the girth webbing and this thinned leather at the point marked A. Why does this matter? Surely it’s hidden and protected underneath the panels? Yes, if you run your hands along the panels you won’t feel these bumps but the horse may have to take 100 to 200 pounds of weight through the panels and be assured he’ll then feel it. We regularly see the sore spots and hair loss on horse’s backs that exactly correspond to bumps and rough edge when we open up the saddle. 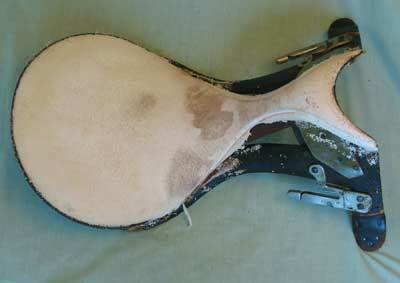 The Port Lewis Impression Pad is an ideal tool to help identify saddle fitting issues like these. 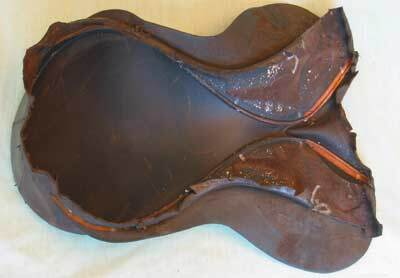 Lumps, bumps, tightness and extra pressure area will all show up in the mould-able putty after riding with the Impression Pad between your saddle and the horse. 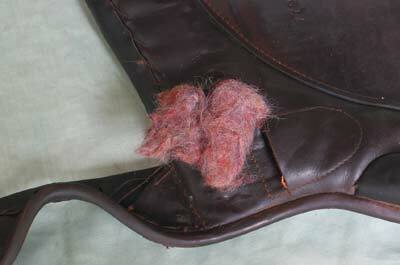 This is another view of that untrimmed leather where you can see what a hard ridge it creates. The nail head can also be seen. See the lumps and bumps page for further examples of this common problem. Here’s another feature we are not keen on. Notice how the leather attached to the upper D ring in the picture hasn’t been trimmed back and overlaps onto the metal strengthening at the back of the tree. This creates another bump to be transmitted through the panels to the horse’s back. Another finishing touch we’d like to have seen is for the trailing edge of the metal reinforcement in the front arch of the tree to have been filed down to give a smoother edge. 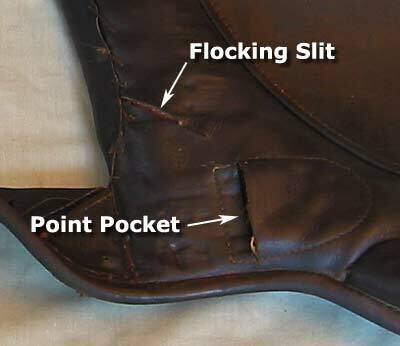 It is this attention to detail that makes all the difference between a poor saddle, likely to damage the horse, and a quality product. And we are left with the seat and skirt. 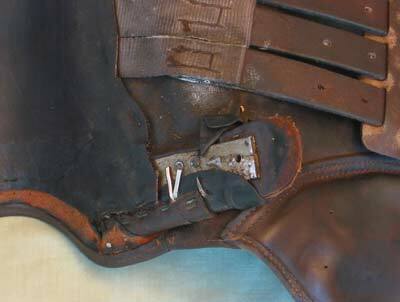 With the girth straps removed you can now clearly see the two spring steel strips, marked A, that give the name to the ‘spring tree’. Their job is to hold the tree in shape when subject to the forces of the webbing on the top of the tree, which is stretched and fixed under tension, and the weight of the rider. 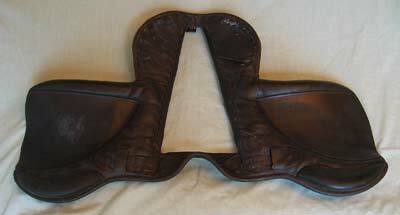 Both of these will try to pull the cantle and pommel together – the spring steel counteracts this. Our next task is to remove the seat cover. It is pre-shaped and sewn together before being attached to the tree. 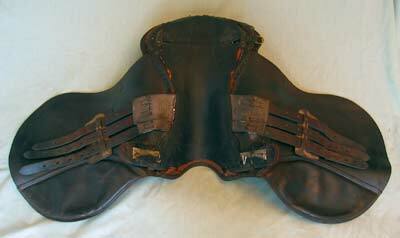 Which leaves us with the top of the saddle showing the latex foam that forms the padding in the seat. 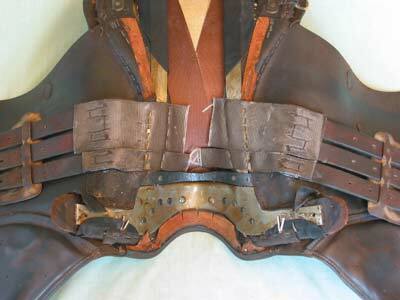 Taking that layer of latex off reveals another curved wedge that fills in the cantle area. And underneath a thick hessian layer that provided the base for the latex we’ve just taken off. We are now down to the basic tree and webbing. 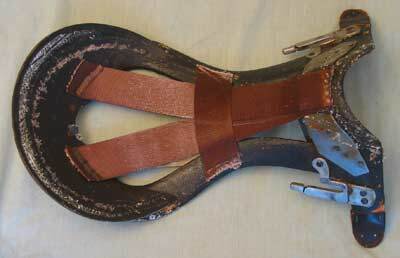 The webbing provides the support for the rider and is fixed under tension. It is down to the skill of the saddler to try and get equal tensions in each strap as different tensions may over time cause the tree to twist. This tree despite being some years old is still straight and true and is a good example of its kind. 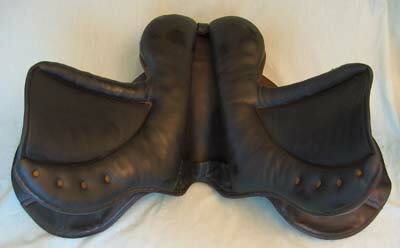 From the outside this saddle looked neat and well made and is fairly typical of a full leather english saddle. 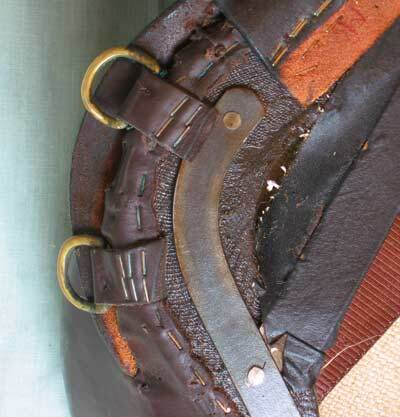 What let it down was the serious misalignment of the girth straps and the sloppy finishing which has left lumps and bumps underneath the panels. 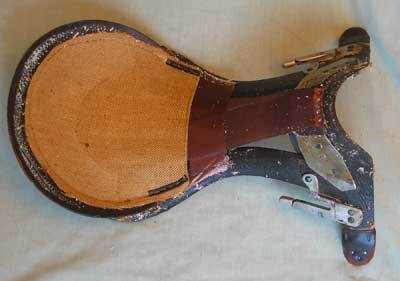 Unfortunately this is more common in saddles than we’d like to see but the good news is that many of these faults can be rectified by a skilled saddler.